Did you ever notice fudge really doesn’t make an appearance outside of the holidays? Think about it. It rolls out around December, makes an appearance at Valentine’s Day and with novel, pastel updates for Easter but then it goes dormant. Am I right? 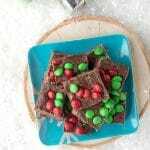 I’m not a huge fudge eater but I do love a good piece of fudge around the holidays. I think if people realized how effortless it is to make, it might challenge the waistlines of more households year round. It is not the most robust in the hotter months, undoubtedly whimpering under mid-day heat at summer picnics, but would happily await the indulgences of a sweet tooth in the cool of a refrigerator. At this time of year when I for one fight to stay warm and enjoy a gas burning fireplace in my library office all day long, fudge is in its element. 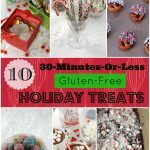 The flavor possibilities are endless and the internet is buzzing with delectable options for gifts, for Santa, for noshing while decorating the Christmas tree or just to make a day a little bit sweeter. Fudge is a ‘no bake’ treat which I also love. 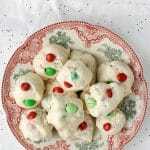 Historically holiday baking has been a favorite pastime in December and part of my family’s Countdown to Christmas. Now with a child in Middle School and one in High School, heavily laden on weeknights with homework, and swim team practice for the elder, a surprise baking session is usually not in the cards. 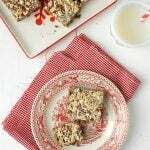 This year I’ll be sharing some no bake recipe options that anyone can both work into their schedule and make! If you are a tentative baker, these recipe will be right up your alley and you’ll get no complaints from your audience (in my case I was tempted to lock up the sweets in the spirit of preserving them long enough for their Dad to have a taste when he returned home from work). Never liking to jump on a mainstream bandwagon, I wanted to make fudge that was a bit unexpected. I love using culinary lavender in cooking (check out these fun savory and sweet recipes ideas using it). It adds a flavor of Provence to anything in my book and who doesn’t like to be transported when eating, (fudge, in this case)? When using lavender be sure to use culinary lavender found in the spice section (or bulk section) of stores such as Whole Foods. Lavender designated for crafting, such as potpourri, has been treated with preservatives and is inedible. 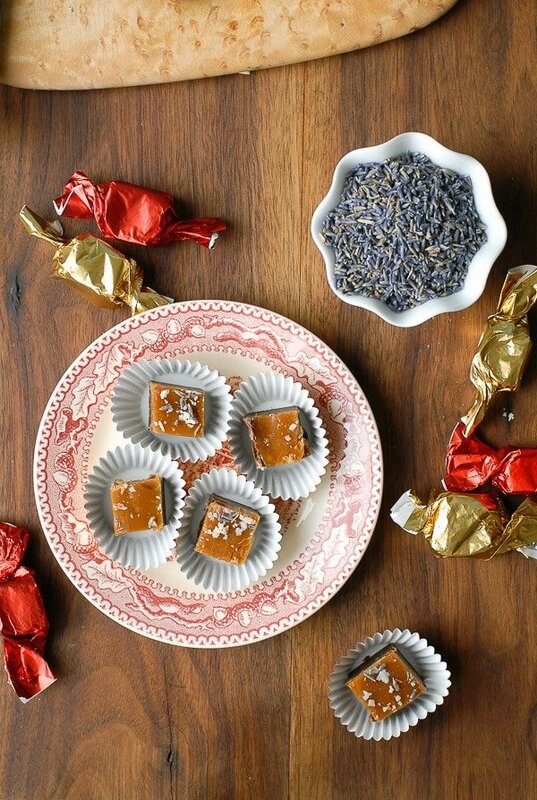 To top this lux fudge is a bit of salted caramel. If you have not made caramel from scratch before it is very easy however there are points in the process when you may be absolutely convinced you’ve done something wrong! Caramel is melted sugar with cream and butter added; that’s it! The process begins with the sugar on its own, heated, until it melts. It appears to begin melting and then chunks of sugar will form before it finally releases to the liquefaction process. I for one was sure the first time I’d messed it up, but it’s just part of the process. Again when stirring in the butter and cream the mixture begins to percolate like a little mud pot and you won’t imagine this mixture will become a silky caramel; but it does. Once it is removed from the heat the bubbles begin to dissipate and it turns into a thick, luxurious caramel. 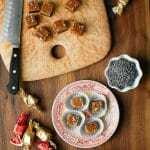 When complete the caramel is firm without being candy-like hard, and softens at room temperature without becoming gooey. The fudge is fantatic on its own if you prefer to bypass the caramel top. Though the finished flavors of the two together are unique and divine. 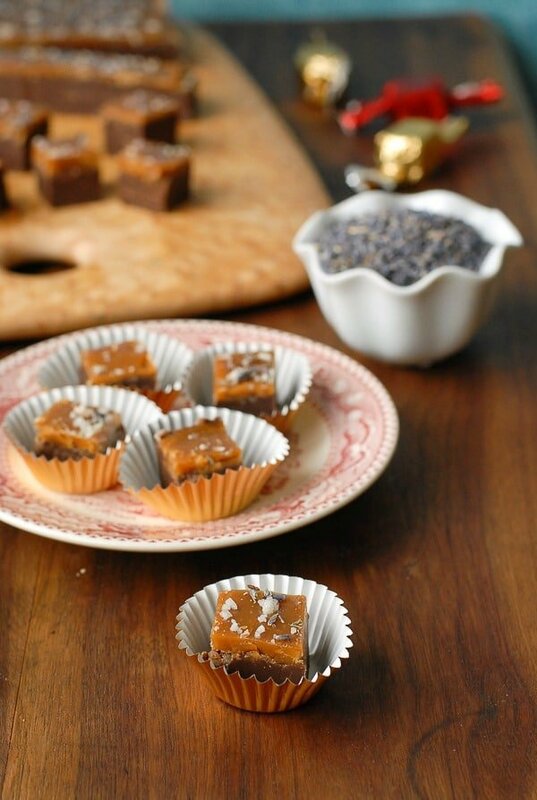 The sophisticated flavor of chocolate and lavender make this creamy fudge unique and unexpected. The addition of the salted caramel top make it a home run. The fudge is fantastic on its own for those preferring to stop there. 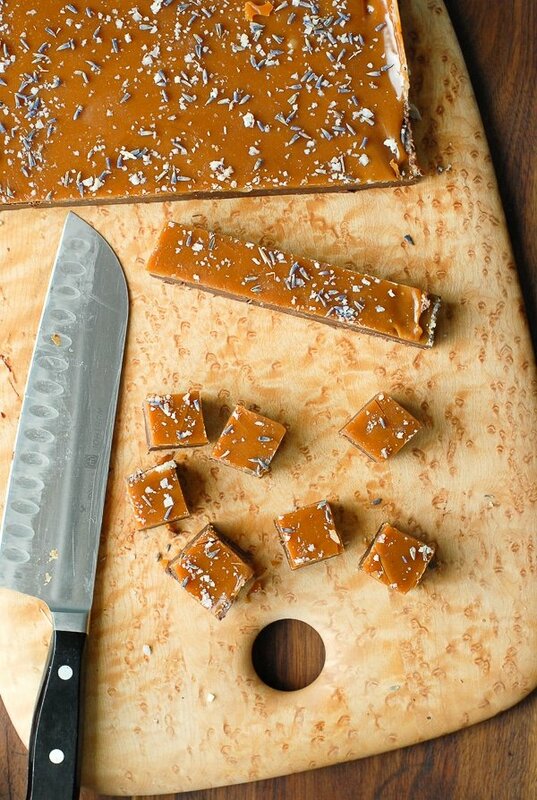 The caramel provide an additional dimension to the depth of flavor.When removed from the refrigerator the caramel is firm but will allow cutting. Once it sits at room temperature it becomes semi-soft (between firm like a brittle and gooey like a thick sauce), making it easy to eat and easily staying atop the fudge. The recipe may be cut into pieces of any size but I find the richness and beautiful flavoring leaves a 3/4 inch square piece a perfect size.The two parts of the recipe are very quick to make though each needs a few hours to chill. Can I ask what I did wrong with the caramel? I let the sugar melt until it dissolved, added the butter kept stirring, added the heavy cream and then some of the sugar balled up into hard rocks of sugar. This is the first time I’ve made caramel this way. Can you offer insight into what I did incorrectly? Without having more details my guess would be it might have to do with the temperature of the melted sugar and the temperature of the cream. I’ve not encountered anything like this however so I’m not sure! I just made the recipe and I can’t wait to eat it! Unfortunately, I made it for a party and I cannot keep it all for myself. Could you tell me hoe long this fudge can last in the fridge and if I can freeze it? True confession, it’s never lasted long enough at my house to find out. I’d keep it tightly wrapped so it doesn’t dry out and it should be fine for at least a week. On freezing I’m unsure if the salted caramel top could become brittle so when you thaw it the fudge wouldn’t stay together (I have not frozen it before). So, I made this…did the fudge in my thermomix and did the topping on the stove. It is delicious and the fudge is such a great texture. The lavender taste is so subtle. I’m in lovender. I did not quite take the caramel far enough but I have had no complaints. I make lots of fudge and this is definitely going to be on my permanent rotation. YUM. Thanks!! Oh I’m so glad to get your comment! Glad that you loved it! Thank you Anne-Marie! No problem. I just wish I could post a photo but I don’t get the option to. Do you have instagram? I could share the photo with you there. It does, doesn’t it?! However in a 9×9 inch pan, there are 12-3/4 inch squares per side of the pan; when multiplied it makes 144. Of course you can make the squares larger or smaller but I enjoy the bite-size squares. Hi Donna. I really don’t have any experience working with substitutes for sweetened condensed milk unfortunately. I did some reading after seeing your comment and know there are a number of recipes to make a vegan version however it seems with mixed results depending on the milk used. Personally I’d give it a try and see how it goes! Pinned! 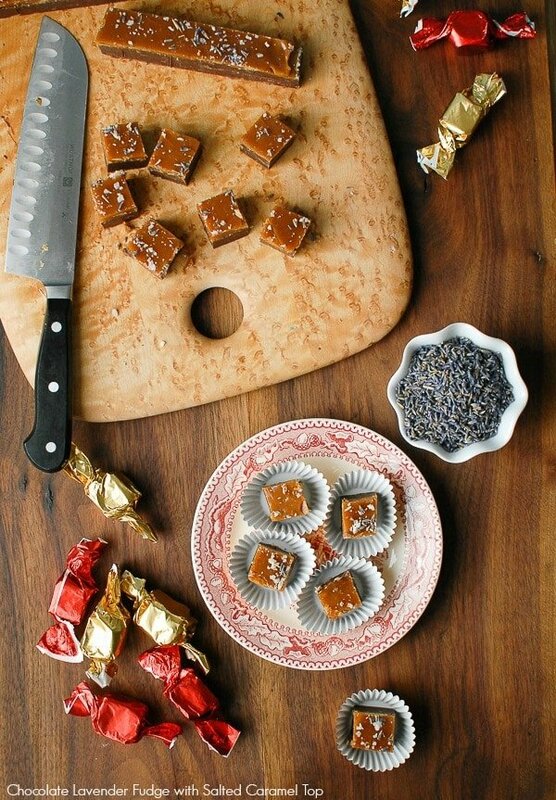 This looks beautiful – I adore adding lavender to sweet treats. Seriously! That is so true about fudge.. the last time I made it was around christmas and I just made it again this time of year. Totally gets the shaft! Loving this gorgeous recipe Toni, especially with the lavender! It’s a holiday tradition at my mom’s to make fudge. I love how you made a salted caramel layer to this! It really is a holiday treat, isn’t it? The caramel, lavender and chocolate flavors are really great together. For the sake of my waistline I need to hide it from myself!